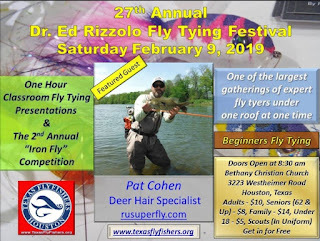 This February, the Dr. Ed Rizzolo Fly Tying Festival will celebrate it's 27th year as the largest fly tying event on the Gulf Coast. Hosted by the Houston-based Texas Fly Fishers club, the fest annually features one of the top names in fly tying and/or fly fishing. It also features nearly a hundred tiers from across Texas, Louisiana and other states. TFF has announced that Pat Cohen will be their headliner for the 2019 festival. Cohen is considered one of the world's top deer hair tiers as well as other patterns for bass, trout, pike and other species. Pat isn't just a tier who ties flies, but an avid angler who does on-the-water testing of patterns to find what works. Cohen was featured at the Contraband Fly Casters Expo in Lake Charles back in July. For those who missed this great fly artist, here's another opportunity. 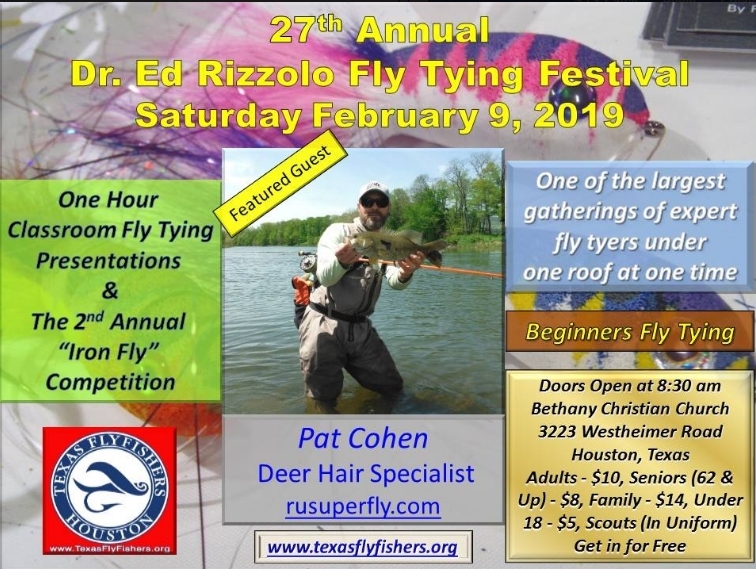 The Rizzolo Fly Tying Festival will be held on Saturday, February 9th at Bethany Christian Church, 3223 Westheimer Road in Houston. The Festival opens at 8:30 am and tying will continue until 4:30 pm. For more info, click on the image (for larger size) or go to www.texasflyfishers.org.